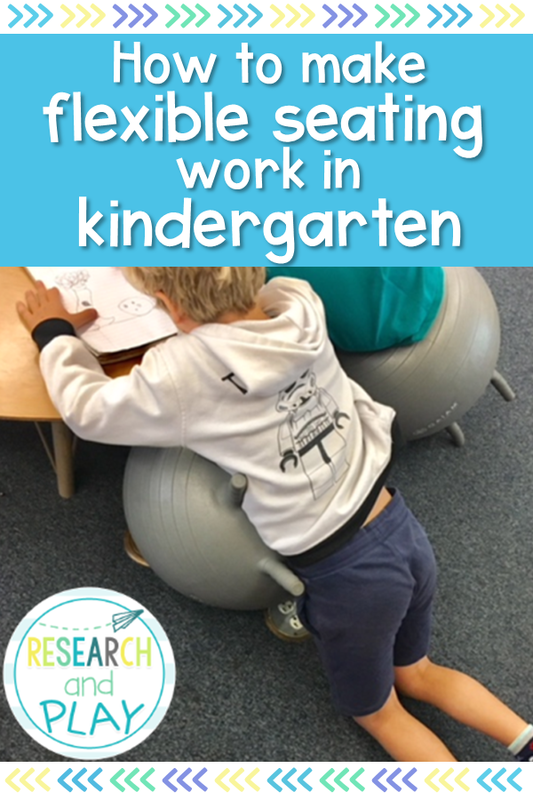 I've wanted flexible seating since it started "trending" a few years ago. 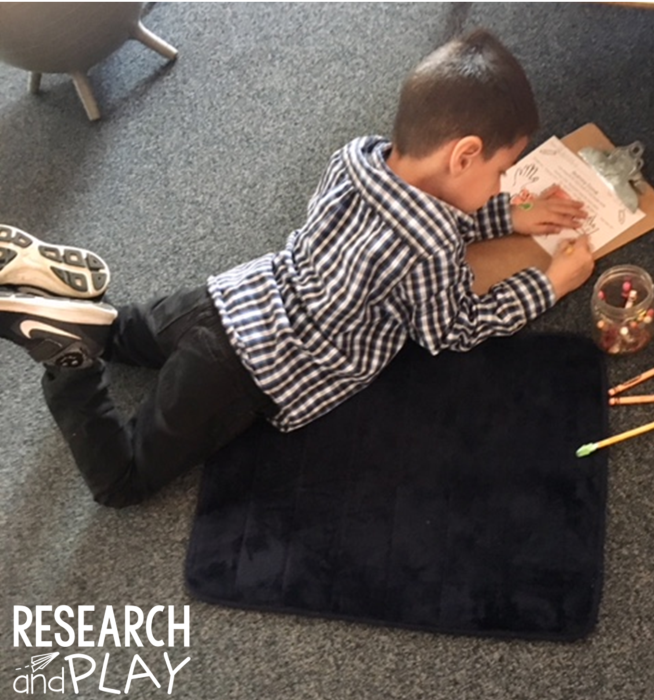 Teaching kindergarten, I was so intrigued by the notion of replacing the typical tables, chairs, and rug layout of my classroom into something more developmentally appropriate. I held off for a while, watching how wobble cushions, rocker chairs, kick bands, and yoga balls were working (and not working) for other teachers. After one particularly hard kindergarten class, I thought there was no way it was going to work for me. But with a sweet class and renewed energy, this year I dove in. 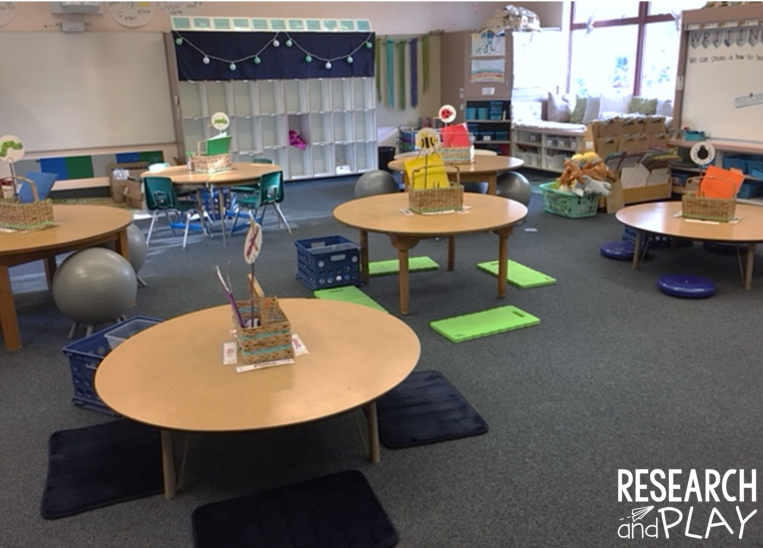 Here's how I've made flexible seating not just a hashtag, but a true part of our classroom identify and environment. 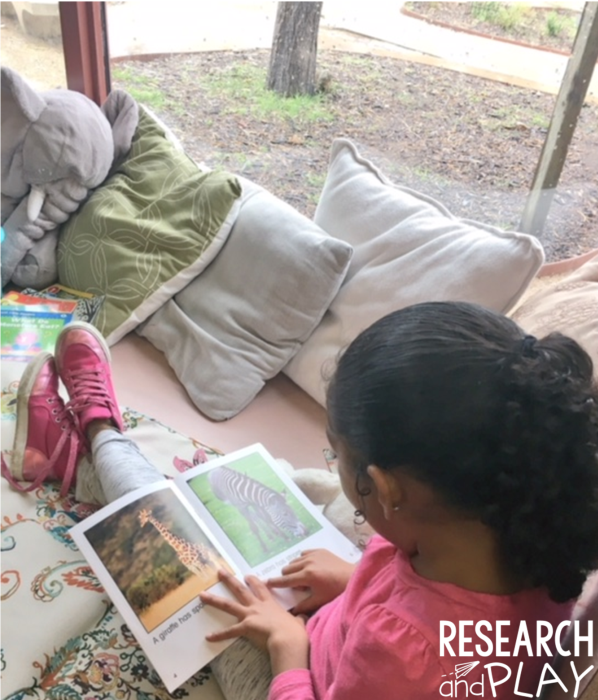 Well I'm no guru, and there are people who've literally written books on this subject, but in a gist: Flexible seating means that you've allowed your students to sit, learn, and be in a space that feels comfortable and helps them focus while also giving their bodies the ability to move and adjust as needed. At least that's my working definition. I've been following other educators who were sort of the pioneers of the flexible seating movement and trying to learn from their successes and, well, failures. I took note of what types of seating teachers of young children (PreK-1st) were primarily using and what they were saying just wasn't working for those kids. I had a lot of notes. ...and I could go on. It got a little overwhelming thinking about how much I'd have to change in my room to become a #flexibleseating classroom. Thankfully, I continued to wait and watch, observing my students, and trying to figure out what would logically work for us. If you teach kindergarten you know how much their little bodies NEED to move. Expecting a 5 or 6 year old to sit "criss-cross applesauce" for your entire 15 (hopefully not longer) minute lesson doesn't really work for all kids, nor does it have to. 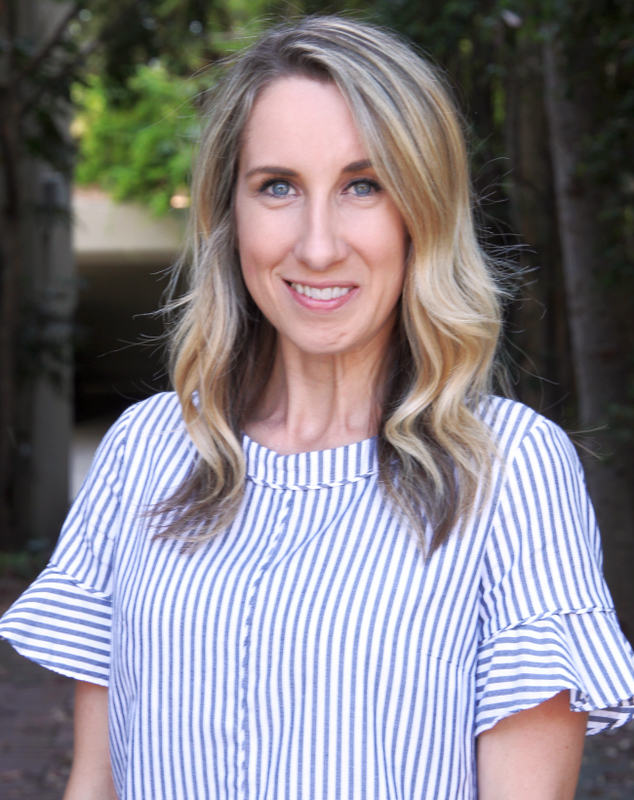 I knew that whatever I did, I needed to encourage my students to get comfortable in their bodies while also respecting personal space of their peers. So here's what I went with! I still have all 6 student tables plus my U-shaped teacher table and an art table. The biggest difference was the removal of 20 of my 30 chairs and taking out our big meeting area rug. Once those things were gone, it felt like our room doubled in size! 8 kid-sized yoga balls with "feet"
I already had 2 stools from IKEA as well as pillows and cushions that my students read on. Those are now just more options for when students are moving around the room. More about that in a bit. This really was the biggest challenge of it all. 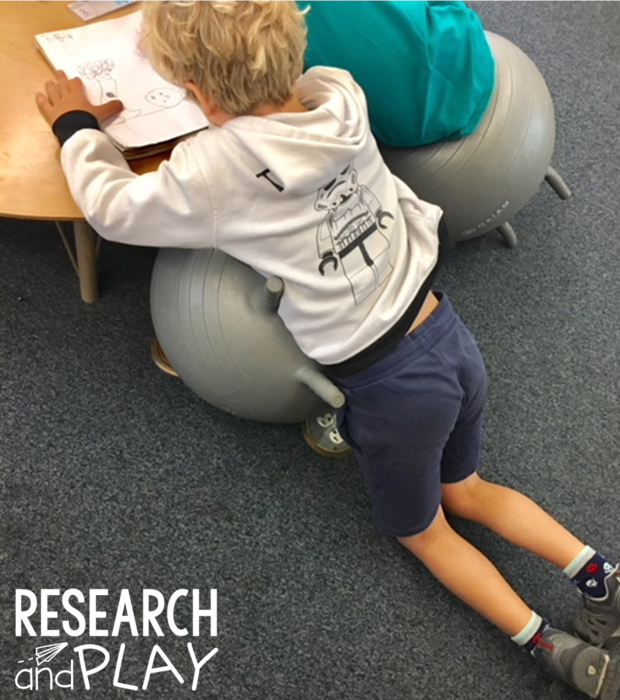 I wanted my students to be able to choose what type of seating worked best for their bodies each day (that's the main point) but I didn't want them to choose the same type of seating every day just because it's fun (hello, yoga balls). The first week was a hot mess, honestly. 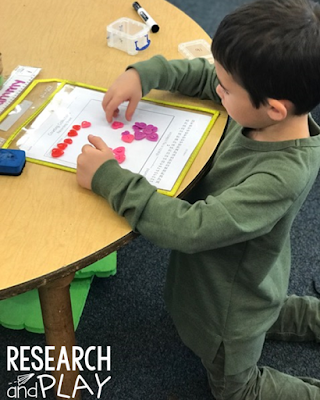 I tried each day to assign flexible seating to each student, but that didn't work because I had them already assigned to tables. Yoga balls didn't fit at the short tables and wobble cushions were too short for the regular tables. Students would be sad when I'd assign them something they didn't really want. It didn't go well. 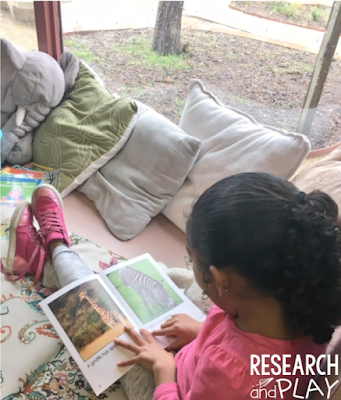 After reaching out to the amazing Instagram community of flexible seating gurus, I got some great suggestions for week 2. So that next Monday, I rolled out the strategy I've been using ever since. 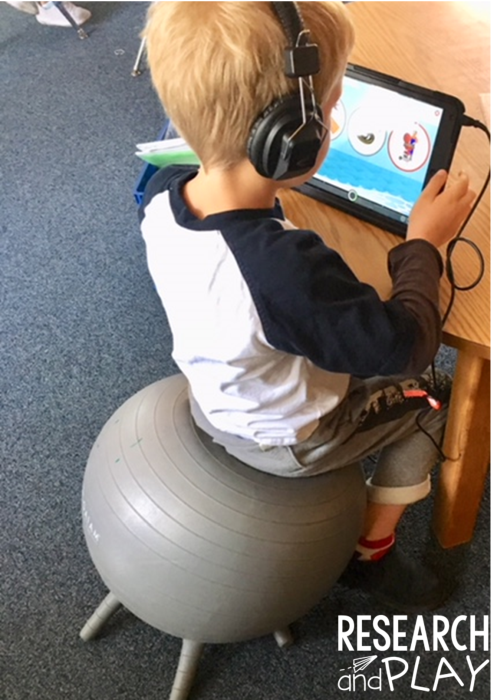 It's not perfect, and it's not true flexible seating in that my students are still assigned to sit somewhere (sort of), but it's worked pretty well for us. We rotate tables weekly. The type of flexible seating at that table remains with that table. If you sit at the ladybug table, that's where the wobble cushions are. The bumblebee table has the garden kneelers, the caterpillars have the yoga balls, etc. 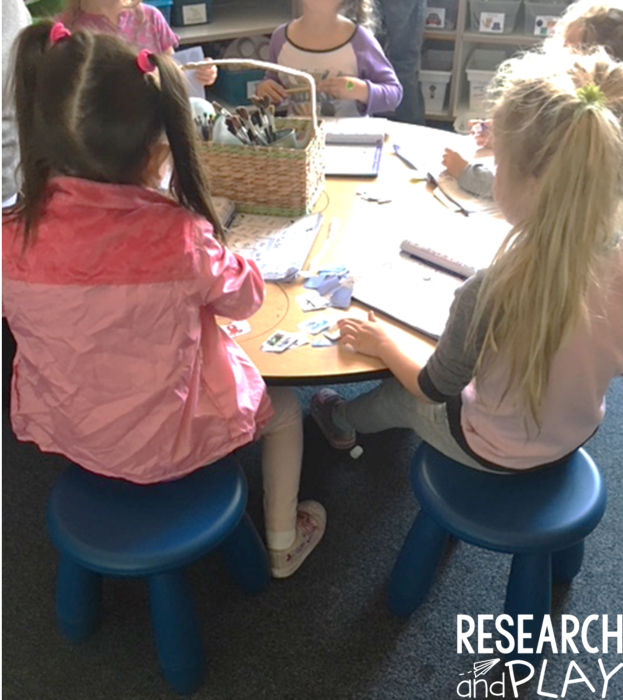 When it's class meeting time, number talk, mini lesson, or read aloud time, students grab the flexible seating at their table and bring it down to our meeting area. Sometimes you don't even need the entire mat! The kneeler table is tall enough to be a standing table, too! Look at the collaboration happening around this table! It's working well for him, but for other students, the yoga balls are still too hard to balance on. The kids' legs were just too small to help them out! And the craziest part?? Many of my students prefer not to use any flexible seating at all during meeting times! I'll see them come down and just sit on the floor, and when I ask them if they want their yoga ball/plush mat they say, "No thanks!" I was actually shocked by that. Now, there are some students who take that yoga ball with them all over the classroom. And bless their hearts, they need that big, bouncy movement, so I'm all for it. Since we removed our big rainbow rug, we've had to reinforce our understanding of personal space. But, no more "criss-cross applesauce." If you need to stretch out your legs, go for it. If you need to lay on your tummy for a few minutes, I like doing that, too! I'm fine with it. My students understand that they have to respect other people's bodies and space, so they make sure their feet and fingers are away from other people. It hasn't caused a single issue yet. Overall, I've been pretty happy about our transition to a flexible seating learning environment. It's given my students more freedom and ownership in our classroom, and I feel like I've given them a more developmentally-appropriate space to learn. With the transition to both flexible seating and rotations, this year has probably been my favorite of my entire career. I feel like my students are truly getting what they need for their academic growth, their physical awareness, their brain development, and their social skills. I couldn't be happier with these transitions and can't wait to start them first thing next school year with a new group! Happy as a clam, using that yoga ball in whichever way felt best! Now, a few insights. Remember the garden kneelers I said I wouldn't recommend? Yes, well, we all know that kindergartners are very tactile and love to touch and manipulate things. What this teacher didn't think about was giving my little ones something made out of pliable foam and expecting them not to try to manipulate it. The edges around all 4 kneelers have been picked off, chunks of green are now a permanent fixture on our floor, pencils have made their gouge-marks all over one of them, and, believe it or not, another kneeler has been beautifully decorated all around the sides by a little love's teeth marks. Also, the yoga mats are working great, just be sure not to get ones that have any printed design on them. The design is beginning to flake off, and I'm sure it has everything to do with the yoga mats being cheap and not my kids' fingers chipping away at yet another seating item. And finally, the plush memory foam mats (which are bath mats) are super comfy, but one has already busted a seam. I can probably break out my little sewing kit to remedy it, but curious hands will probably bust my seam, too. So there you have it, a success story (with a couple of little tweaks) of flexible seating in kindergarten. If you've been on the fence about trying it, I highly suggest submitting a Donors Choose project for your materials. That's what I did and through generous donations of about $475, I was able to make these changes. If you're doing it out-of-pocket, though, you can get creative with your materials and do a little at a time. All these pillows in my reading area used to be my throw pillows in my apartment that I just got tired of! Reuse and recycle things from home! If you try it or already do it, let me know! I'd love to hear if you have any crazy bite-mark stories, too!